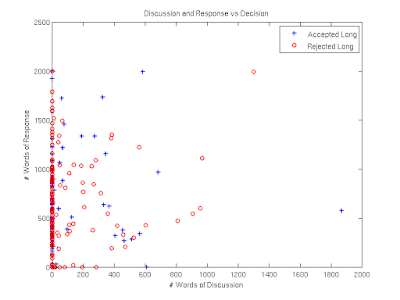 natural language processing blog: Some NAACL 2013 statistics on author response, review quality, etc. 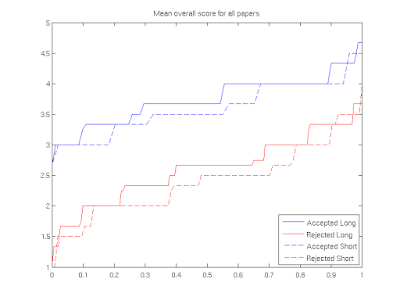 Some NAACL 2013 statistics on author response, review quality, etc. NAACL 2015 has just passed, NAACL 2013 is long in the past. One bonus of being a program chair is that you get to have fun with data. In this post I'd like to review two pieces of data, one related to author response and one related to review quality assessment. tldr: Generally, I think author response is useless, except insofar as it can be cathartic to authors and thereby provide some small psychological benefit. And in general people don't seem that dissatisfied with their papers' reviews, and this is largely independent of the outcome of the paper (conditioned on selection bias of those who responded). NAACL and other conferences have for some time allowed authors to respond to their reviewers, ostensibly to correct errors, but more often just to argue their position. Most people I've talked to who are in favor of author response say that it made the difference for one paper between it being rejected (pre-response) and accepted (post-response). Of course this is unknowable because decisions aren't made pre-response, so what these authors are reporting is their guess as to accept/reject before response versus actual accept after response. My own internal guesses of accept/reject are often off the mark, so you can imagine I don't find this argument particularly strong. 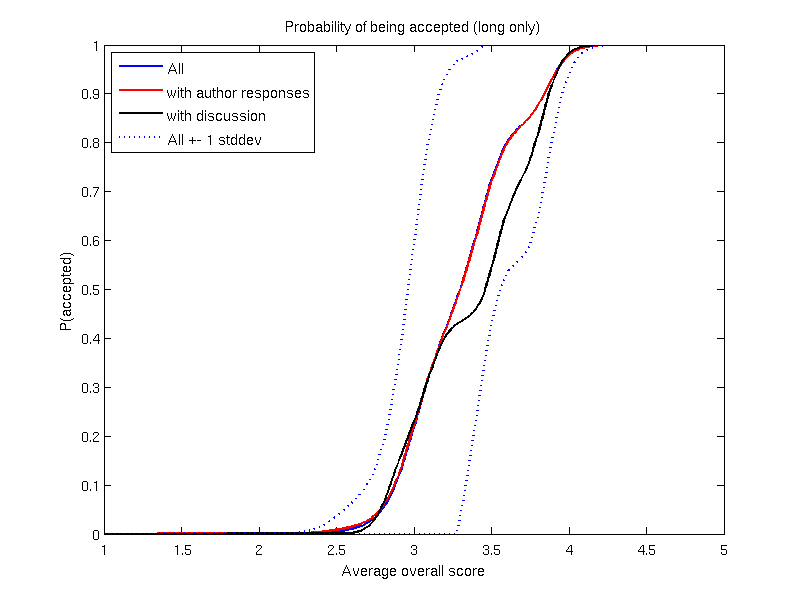 To give a sense as to how hard this prediction is, here is a plot showing whether your paper got accepted or not as a function of the mean overall score. Here, the x-axis is the cumulative distribution of papers (there were more rejects than accepts, so the length of these is normalized to percentage) and the y-axis is the mean overall score for the paper. Focusing just on the solid lines (long papers), you can see that there were one or two papers with average scores of 3.6 that got rejected, and several papers with average scores of 3.0 that got accepted. 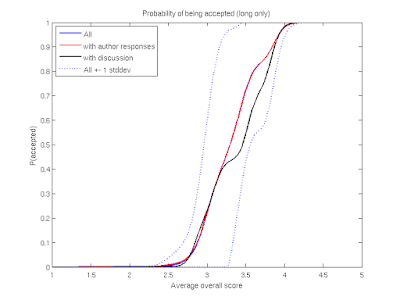 If instead you look at "probability of accept" given mean overall score, basically what you see is papers with a score of 2.8 or lower are almost certainly rejected; with 3.9 or higher are almost certainly accepted, and around 3.2 it's an absolute toss-up. This is only for long papers (it looks the same for short). Each dot is a paper and red are rejects, blue are accepts; open circles means no response. 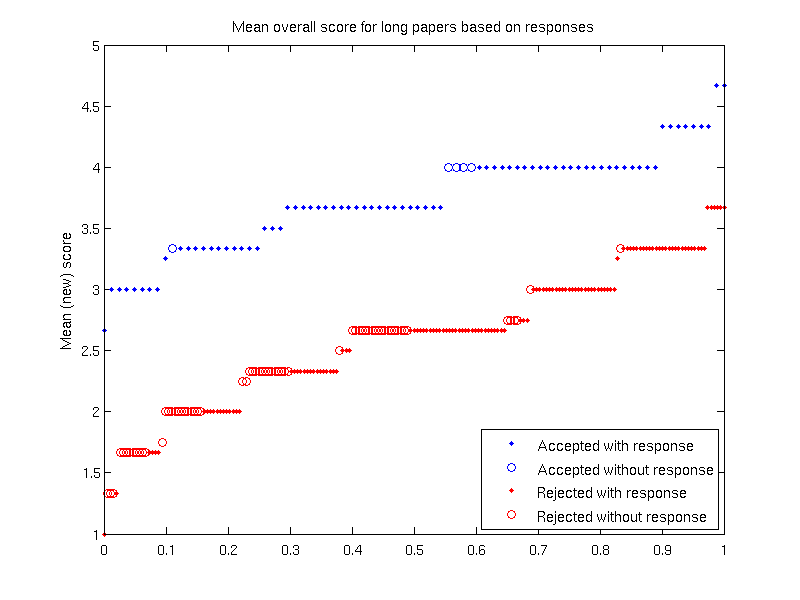 Definitely people with scores less than 3 responded less frequently than those with scores above 3, but even the top scoring papers all included some response. There were some "hopeful" papers with scores less than 2.0 that responded, even though it was certainly not useful. Here, we again have one dot per paper (these are randomly perturbed with small variance so they're all visible). 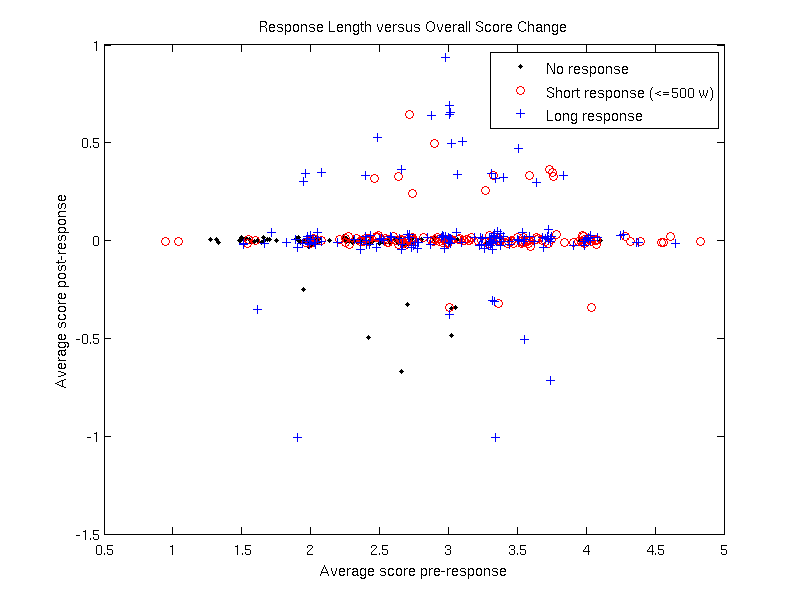 Along the x-axis is the original score of this paper; along the y-axis is how much this score changed between the initial review and the final review. Overall the average absolute change across all papers is 0.1. The vast majority (87%) didn't change at all. You could also say: well, maybe the scores didn't change much, but the review text did. Again, it's pretty rare. Out of 430 reviews (long papers only), 3 reviews decreased in length (~50 words), 46 increased by at most 100 words, and 49 increased by over 100 words (wow, awesome!). But for 80% the review didn't change at all. Here, a few results stand out. 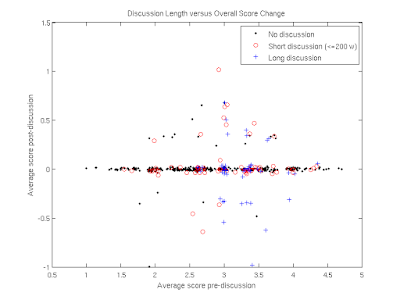 First, there are slightly more score changes as a function of discussion than AR. Most of those worrying dots below y=0 that didn't have a response seem to have gone down due to discussions. Moreover, a few scores that went up (on the low-scoring, almost-certainly-rejected papers) did so with no discussion, suggesting that AR did change those scores. But around the x=3.2 position (the true borderlines), almost all of these with score changes had discussion, though plenty had discussion and no score change. As opposed to the x=3.2 position in AR in which they all have responses, and still the majority of scores don't change. On the x-axis we have the final score of the paper, and on the y-axis we have (a smoothed version of) the probability that this paper is accepted. 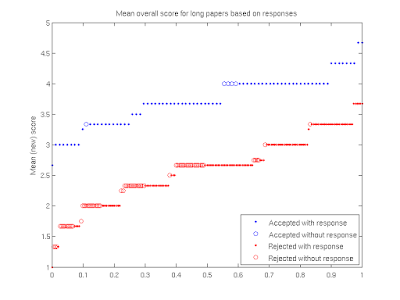 The two nearly identical curves (red and blue) correspond to blue=all long papers and red=all long papers for which the authors submitted any response. In this setting, there really is almost no difference. 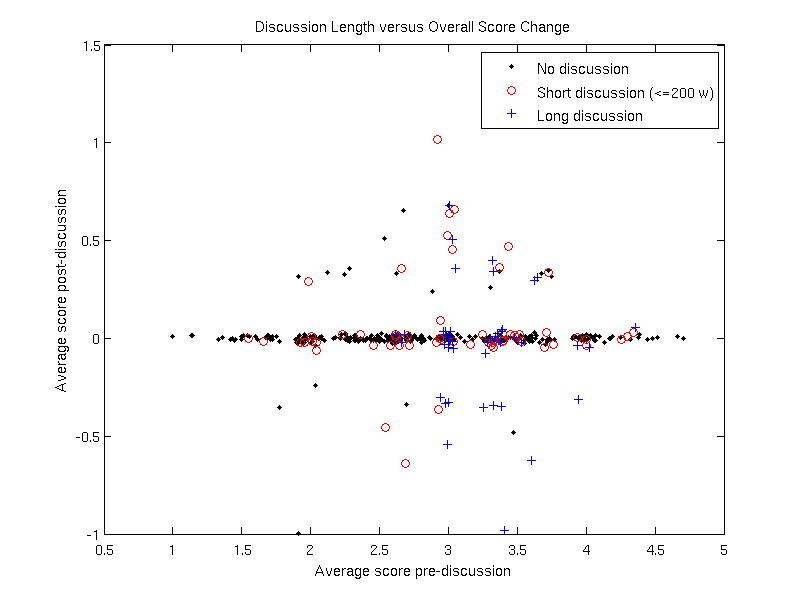 The slightly different curve (the black one) corresponds only to papers in which the reviewers engaged in a discussion. Around the critical point (score in the 3-3.5 range), discussion uniformly decreased odds of acceptance, which is of course not surprising for anyone who has ever participated in discussions. You should take all this with a grain of salt, because all three of these curves are within one standard deviation of the blue curve (dotted lines). 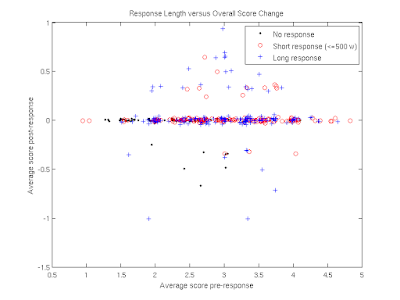 The x-axis is the amount of discussion and the y-axis is the length of the response. See all those dots along x=0? Those are the ones for which the authors responded (in one case with a 2000 word essay!) and for which there was absolutely no discussion. And most of them are rejected papers. Some of you may recall that we did a post-conference survey of how much you liked the reviews you got. We truly did this at a later point in time because we didn't get our acts together earlier, but now I'll claim we did it at a later point in time so that authors were no longer emotionally distraught by their reviews. We presented each corresponding author with their old reviews, but hid the scores from them (I doubt any/many went back to look). They were then asked, for each review in turn, how informative it was and how helpful it was. They could choose 0=not, 1=sort of, or 2=very. 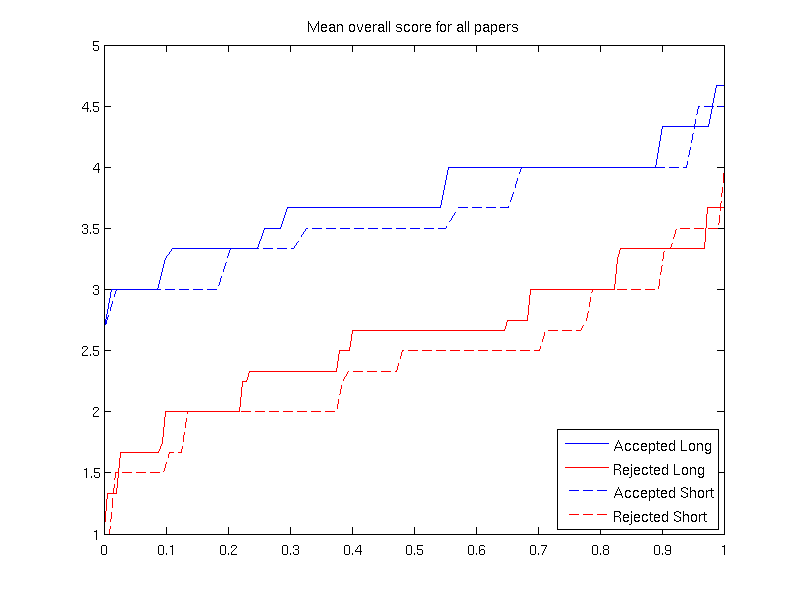 Basically authors of accepted papers didn't particularly find their reviews much more informative (+0.14) or helpful (+0.02) than those of rejected papers. Here, the first column (rating) is how the author scored the review. The second column is the average overall score that a reviewer gave an author who gave them a score of zero. For example, for reviews that were rated informative=2, the average score for those reviews was 3.21. Again, basically there's no effect. Just to feel good about ourselves, authors do, in general, seem not-too-unhappy with their reviews. The only real difference is that rejected papers did have twice as large a frequency of "informative=0", but the rest was pretty close. I think of complaining about review(s|ers) as a staple hallway discussion, sort of an attractor state if you run out of other things to talk about. And we all remember the worst reviews we have had and often forget about the good ones that really do help our work get better. As Lillian Lee said at NAACL this year, it's usually our own fault when reviewers don't understand our papers. And keep in mind that all these numbers have huge randomness associated with them, for instance related to the NIPS experiment. Despite this, it actually seems that we aren't too dissatisfied with our reviews. Only 11% of reviews were considered uninformative and, while I think we should strive to get this number down, I don't think it's that horrible. Especially when I consider the fact that 19% of papers have an average score of 2.0 or less, which basically means they were submitted not standing a chance (for a wide variety of reasons). In general I don't think author response has an effect on the outcome that makes it worth the time and energy it takes. It might make authors feel better, but this is temporary when their paper almost certainly enjoys the same fate after response as before. I do think discussion is useful, and I'd rather see us use more time for discussion but cutting out response. Perhaps by reducing the number of papers any given area chair has to deal with. We should realize, though, that discussion almost always serves to lessen the likelihood of acceptance, probably because it's easier to argue against a paper than for, and reviewers don't really have any incentive to stand up for a paper they like, leading to a veto-effect. From my perspective as a (nearly done) PhD student, I've found that the informativeness and helpfulness of reviews I've gotten has increased with my learning to write better paper titles and abstracts. Before I started reviewing, I didn't really understand that those play a role in helping to get more qualified or interested reviewers. I'm curious if the reviewer confidence scores end up correlating with how much the authors "like" the reviews? Thanks for putting this together, it was an interesting read. Do you have any information or ideas about relations between acceptance and how popular papers are during bidding? Do the more bid-for papers have a different acceptance distribution? Is it possible that allowing author response reduces the number of angry email messages that the program chairs have to deal with? I was Program Chair of NIPS before we had AR, and IIRC, we had about 20 complaints. The conference has grown much larger, but now we have AR, so I wonder if the number of complaints has not grown as quickly?